Happy Friday! 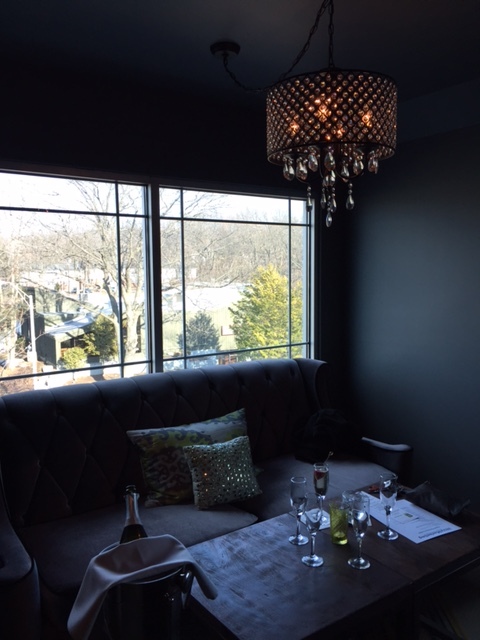 I figured today would be an excellent time to tell you guys why I think Rooftop 120 in Glastonbury is a must visit, especially since we are on the cusp of a long weekend and the weather is supposed to be pretty nice. I attended a blogger event here a while ago and I’m excited to tell you guys all about it! I have definitely mentioned Rooftop 120 in the past and I actually attended their very first blogger event but I can’t help but continue to gush about how great this place is. The cocktails are out of this world (especially when Tyler is making them!). 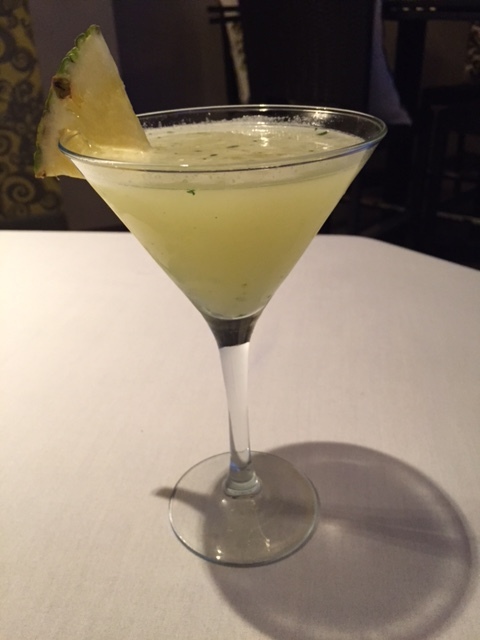 We had the pleasure of enjoying several different cocktails which appear on their menu. Tyler, their bar manager, is always coming up with new and creative drink ideas and it’s so fun to see (and sample) his creations! My personal favorite is the 120 Watermelon, which is made with Tito’s vodka, lemonade, watermelon puree, and fresh watermelon. It is so refreshing and would be perfect to enjoy on a hot, sunny day like today. The views are absolutely incredible. I love going to Rooftop because it honestly doesn’t feel like you are in the center of Glastonbury. Being up there removes you from the busy hustle and bustle of town and makes you relax and really take in the atmosphere. There are many Friday evenings where we just head up there for a quick drink before dinner to just decompress from a long week. Last but definitely not least, the food is always superb and SO flavorful. At the blogger event, we were able to try many different dishes which really shows the depth of talent that Chef Xavier Santiago has, since they all presented such different styles and flavors. My favorite was the Smoked Salmon Rillete which had the perfect balance between the smokiness of the salmon and the creaminess of the sour cream with some tang from the blood orange vinaigrette thrown in for good measure. 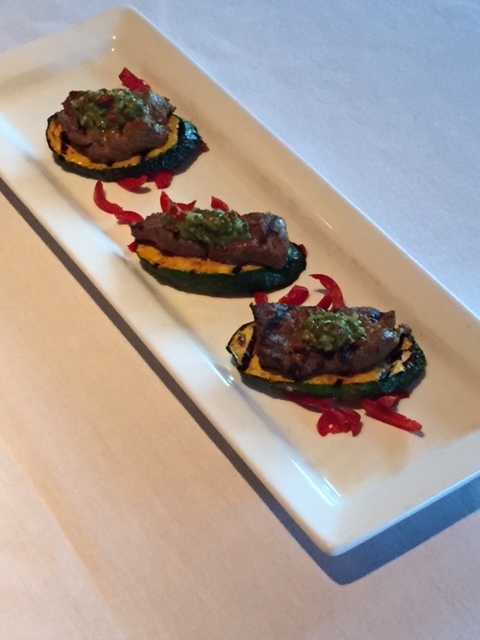 Just based on speaking with the owner and learning more about what they have to offer, it is clear that they put a lot of time and effort into making sure that the entire experience is phenomenal, from the food to the drinks and even the space itself. 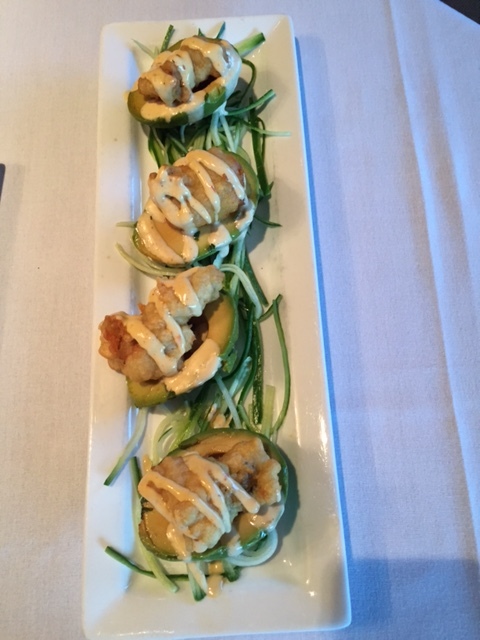 I highly recommend making a visit to the Rooftop this summer and seeing what they have to offer! Disclaimer: I received the food and drink mentioned above complimentary. They were given to me in exchange for an honest review. I was not compensated for this post and all thoughts and opinions are my own. Happy Thursday guys! 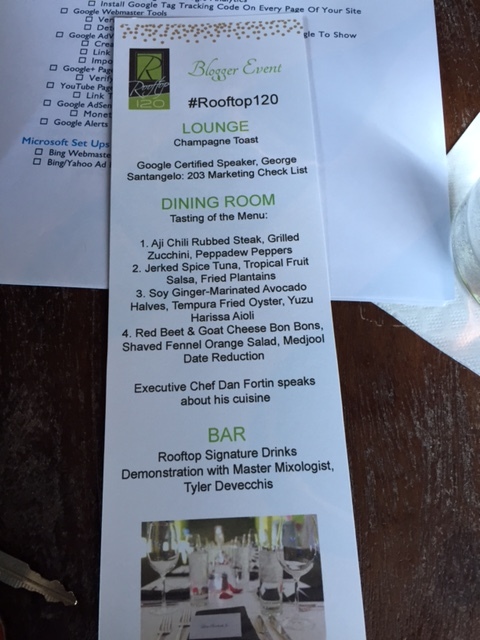 I don’t have too much time to write today but I wanted to share a phenomenal dinner that we enjoyed this past Friday evening at Rooftop 120. 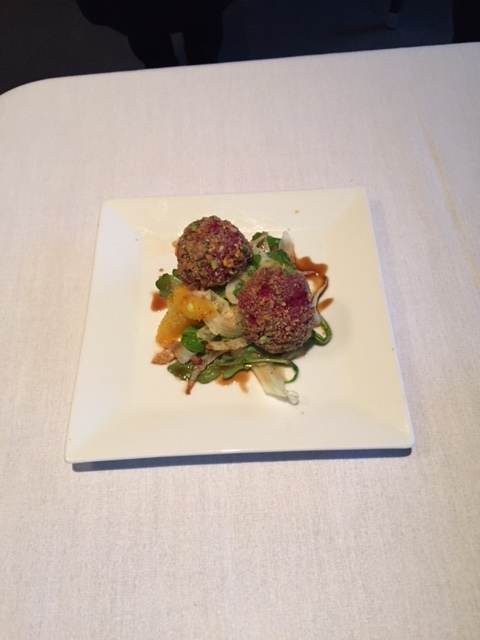 I have reviewed this restaurant in the past and I have never had a bad experience there. With my new job (which is going very well) comes much better hours that allow me to FINALLY be able to enjoy happy hour like most of the rest of the world. Those who know me well, know how excited I am to be able to partake in happy hour at different restaurants. This past Friday was my first chance to enjoy it and I chose Rooftop 120. 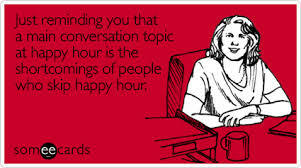 WHY would anyone skip happy hour? Dan and I arrived and it wasn’t too crowded which was great because I like to be able to have a good conversation while sitting at the bar. We were promptly greeted by the wonderful Tyler, who is one of the kindest bartenders I have ever met (besides our good friends at the Diamond of course). He remembered us from our last visit and that made us feel very welcome. 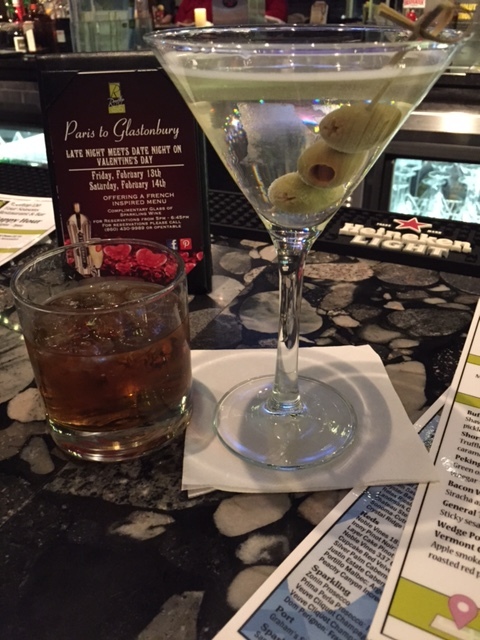 I knew already that I was going to get my new favorite drink, a dirty martini made with pickle juice instead of olive juice. I know that some of you may find this to be a bit strange but I am all about the salt and I’m completely obsessed with this martini. Dan decided to go with something that isn’t always served at every bar, Woodford Reserve, on the rocks. This picture just screams “Friday night”, doesn’t it? 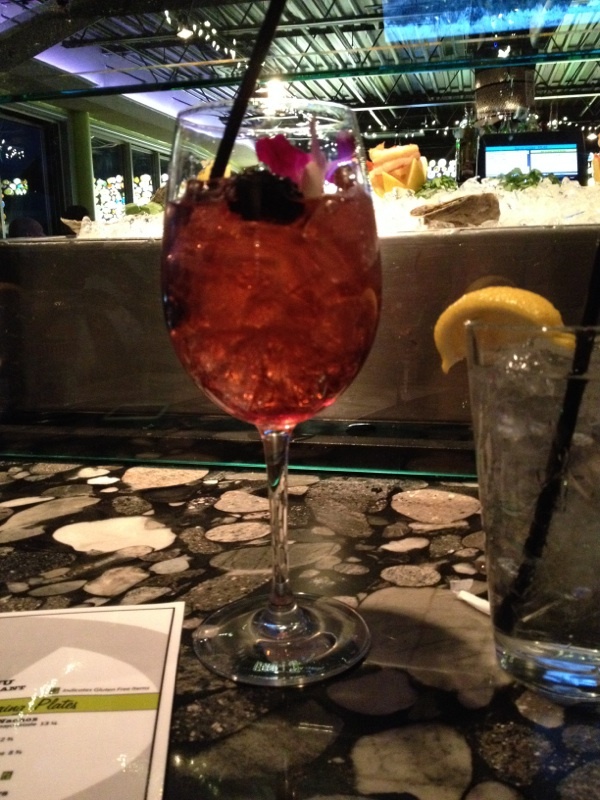 Once we were settled in with our yummy drinks, we attacked that happy hour menu in search of several different dishes. Tyler immediately recommended the bacon wrapped crab cakes and the general tso’s ribs so we definitely went with those along with the short rib sliders and chicken wings. Clearly, I did not have any kind of healthy eating on my mind. I was so hungry I could have eaten the menu itself. 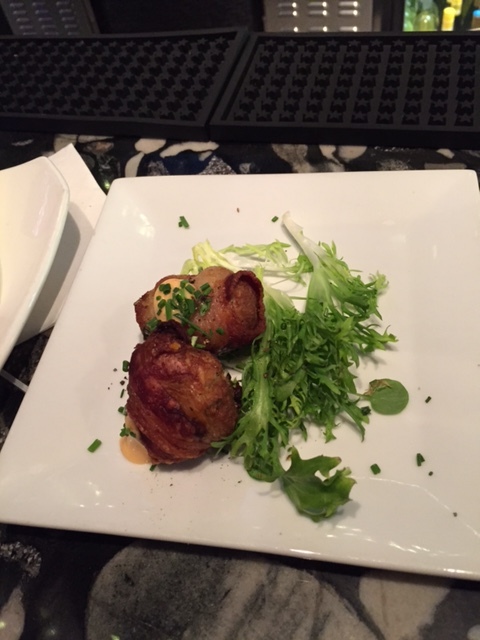 The bacon wrapped crab cakes were absolute perfection. I’m a firm believer that everything should be wrapped in bacon and kudos to Rooftop 120 for being creative enough to wrap a crab cake in it. There were two of them which was perfect because they were so rich and flavorful that it only took one each to satisfy us. 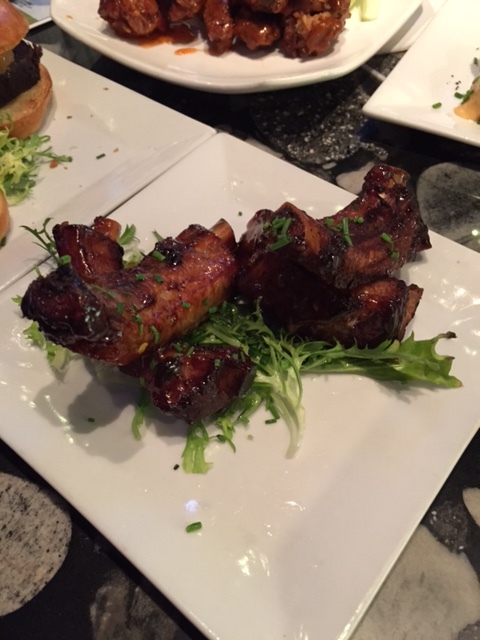 The general tso’s ribs were fall-off-the-bone amazing. I am not usually a rib person but the additional of the general tso’s sauce gave them SO much flavor and they were different than a traditional BBQ rib. 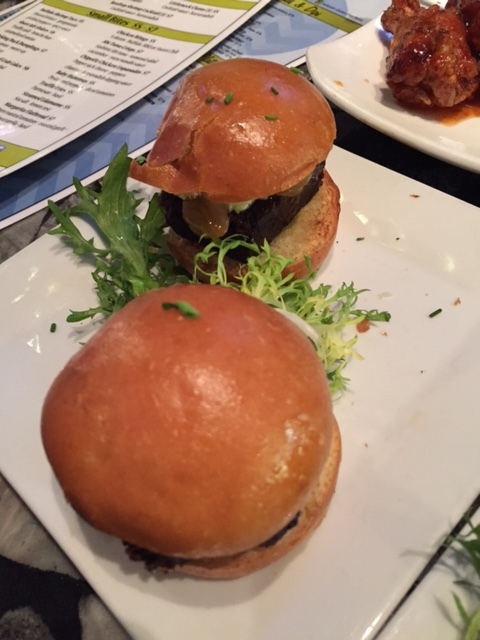 I will fully admit that I chose the short rib sliders solely based on the fact that they were topped with truffle aioli (I mean, are you surprised?). These were so wonderful and again, a perfect size for something filled with so much flavor. I don’t think I have ever had a bad slider. Dan chose the buffalo chicken wings and surprisingly I enjoyed them quite a bit. I’m extremely picky about buffalo sauce and this sauce was very unique which immediately made me love it. It had a little kick but it wasn’t so spicy that I couldn’t appreciate the overall flavor of the sauce. 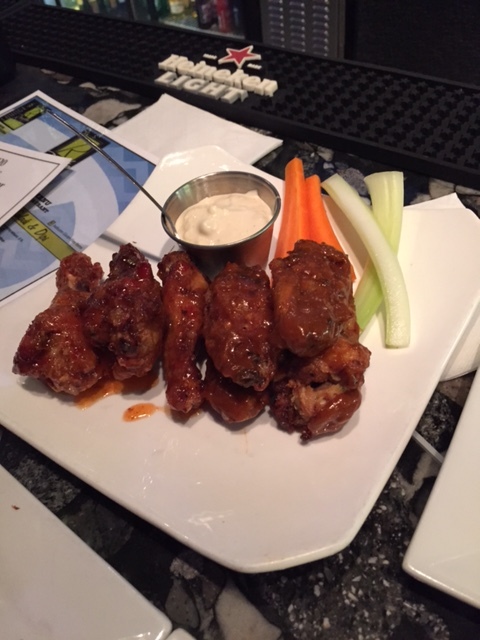 You can never go wrong with the classic buffalo wing. We pretty much inhaled this food and spent a while after just chatting and finishing our drinks. It was a fantastic start to what ended up being a great Friday night. All I can say is, happy hour is the best concept ever and I can’t wait to take full advantage of it. I know I’m a little late on this review but I knew it was perfect for a “What I Ate Wednesday” post. Last Thursday evening, I dined at Rooftop 120 in Glastonbury’s Eric Town Square with one of my closest friends, Carlee. We were celebrating her new job at the company where I work, The Hartford. I usually have a few regular places in town where we go for dinner but I figured a new job called for a fancy (and new-to-me) place. The restaurant wasn’t too busy for a Thursday evening and we settled into two seats at the bar. There was live music playing (I have no idea who it was- sorry!) 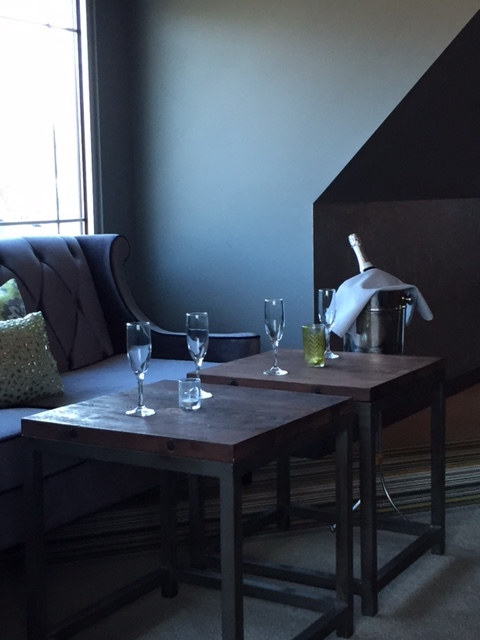 and it was the perfect setting for a celebration. We knew that drinks were definitely in order so we looked over the drink menu (SO many great options) and made our decisions. I decided on a Black Raspberry flavored sparkler which was basically Prosecco mixed with black raspberry puree. There were fresh raspberries on the bottom too! 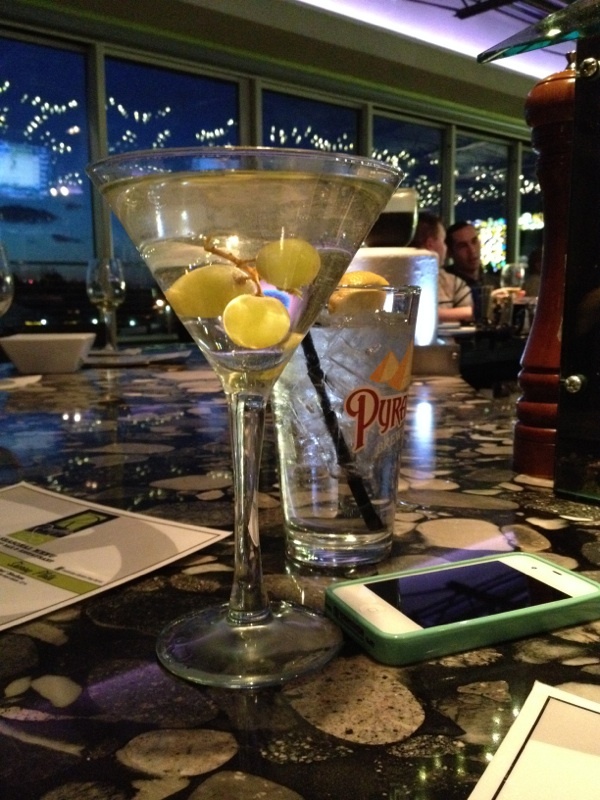 Carlee had a tougher time deciding and our bartender Jenna recommended the White Grape Moscato martini which was Skyy Moscato Grape vodka mixed with white cranberry juice. This was also garnished with fresh grapes. The drinks were both so refreshing and delicious and I can’t wait to go back to try the MANY other drink options. Carlee and I had both looked at the menu online prior to our arrival so our choices for food were pretty quick. 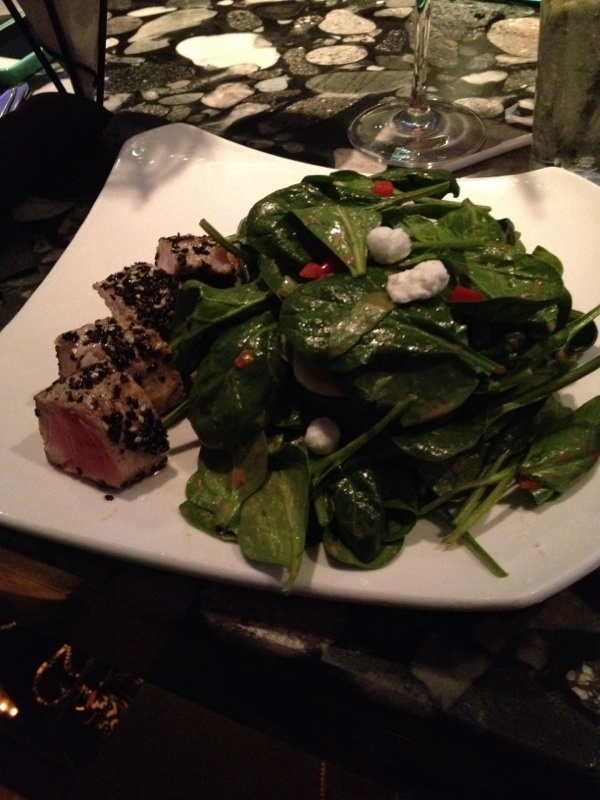 I chose to go with a spinach salad and I added ahi tuna to that. I also got a side of truffle fries because I have been OBSESSED with all things truffle lately. Carlee (who is a self-proclaimed picky eater) got the margarita flatbread. My salad included local goat cheese, roasted red peppers, spinach, ahi tuna, and balsamic vinaigrette. It was SO tasty and the perfect portion for my level of hunger. 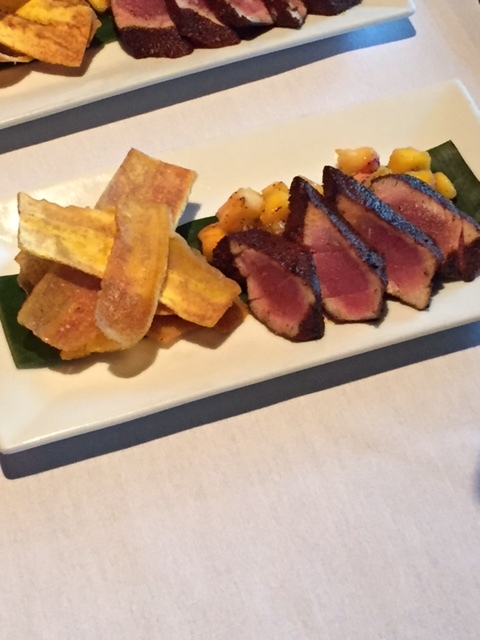 This was only my second experience with ahi tuna and it was melt-in-your-mouth delicious. The truffle fries were good, although they were nothing different from the truffle fries that I always get when I go to Plan B (which happens to be located just below Rooftop!). Carlee said that she enjoyed her flatbread as well and that the garlic flavor definitely stood out and made it different from other flatbreads she has had. Our waitress (she was also the bartender) Jenna was so helpful and charismatic. We were unsure if we were going to get dessert at that point but she had us sold when she mentioned the deep-friend double-stuffed Oreos! These were definitely the highlight of the evening. I look forward to them every year at the local Big E state fair in Springfield, Mass and this was just such a special treat. They were perfectly fried and lightly covered with powdered sugar with a side of milk to dip them in (and you better believe I did just that!). 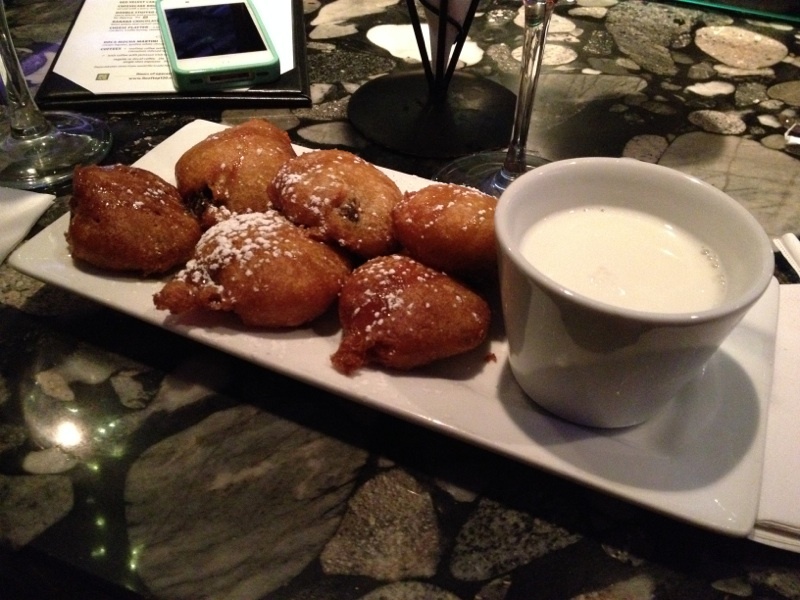 This was Carlee’s first experience with deep-fried Oreos and she was in awe of how amazing they were. BEST part of the meal! So amazing! 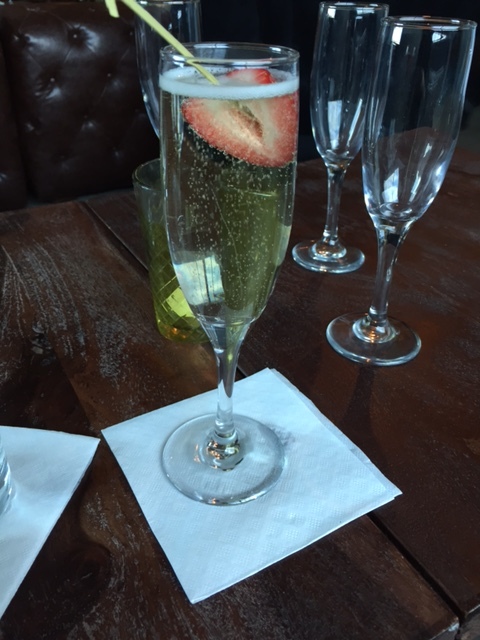 I would definitely recommend Rooftop 120 to anyone who is looking for a great cocktail in a fun setting. While the meal was a little pricey for a weekly kind of meal, it is definitely somewhere I can see myself going for a special occasion or when I’m looking for a place to go for drinks with the girls. Have you ever dined at a rooftop bar? Would you have liked our meal selections? TGIF! I am SO happy it is finally Friday! I figured I would hit you guys with five random things so here goes nothing. I won the Color Me Rad giveaway from For Love of Carrots. YAY! I have never run a 5k before and I’m so excited that this will be my first one. I signed Dan up to run it with me (happy early bday to him ha) and a few other friends are running it so it should be a lot of fun. I’m a little bit nervous about how slow I’m going to be since I haven’t run since the end of fall but I have some time to prepare since the race is on April 26th. Hopefully the weather warms up a little bit before then so I can actually run outside to prepare. Fingers crossed! I’m attending a Tastefully Simple party at Natasha’s house tomorrow night. This should be fun since everyone has been hosting Lia Sophia parties lately and this will be a nice change from that. Plus, I love food (duh) and I am definitely planning on spending a lot of money and getting some new recipes! 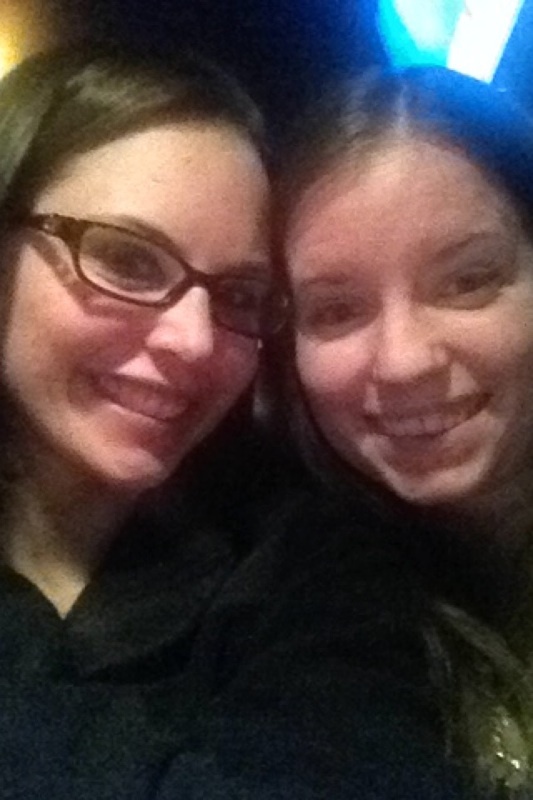 I went to Rooftop 120 last night for dinner with one of my best (and oldest) friends Carlee to celebrate her new job! I will be doing a full review of the meal in a later post since there is a lot to report but it was so delicious. It was even better to be able to catch up with her and just have some genuine girl time to vent about things and also discuss my wedding plans. She has several friends who are currently engaged so she has lots of helpful tips for me whenever I see her. Good food and even better company is always a perfect night for me! In celebration of St. Patrick’s Day this coming Monday, Dan and I will be attending a “Kegs and Eggs” party tomorrow morning at our friend Sarah’s house. We are making mashed potatoes in the crock pot and I know Sarah is cooking up some tasty corned beef so it should be a great time! I’m not sure how I feel about drinking first thing in the morning (especially since we are going out tonight too) but I’m sure it will be fun. We also plan on going to the Hartford St. Patrick’s Day parade after which I have never attended so I’m SO pumped for that. I love parades and it should be very interesting to see those who will have been drinking since the wee hours of the morning. I just ordered the tickets today (pay day $$$) for the Rascal Flatts concert on May 31st. We are big country music fans and this was such a fun concert to attend last year. Tailgating is one of my favorite activities and since a huge group of our friends are going, it will definitely be a great day! I just hope it won’t have rained the entire week leading up to the concert because the hill was insanely muddy last year and drunkenly trying to navigate through that mud was not a fun time. 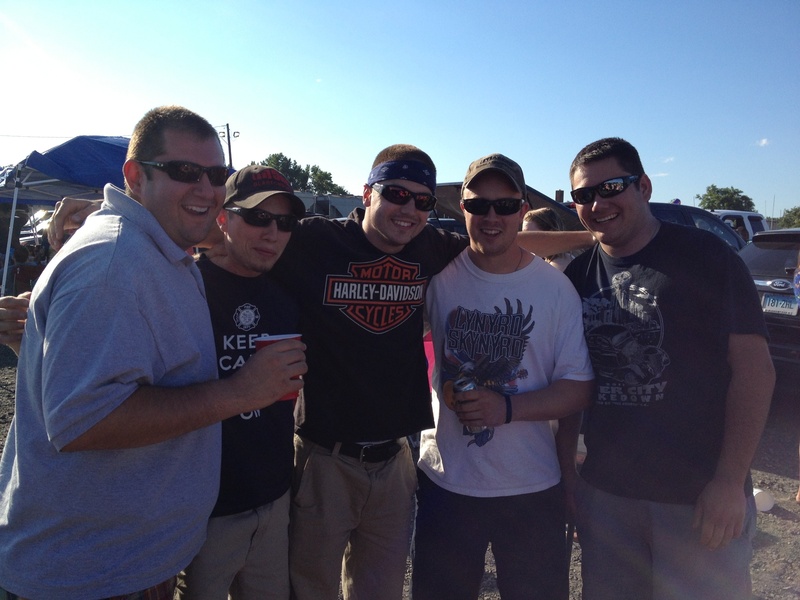 The guys at last years Rascal concert! Alrighty, that’s enough randomness for one Friday. I hope everyone has a fun weekend filled with great food and St. Patrick’s Day celebrations!